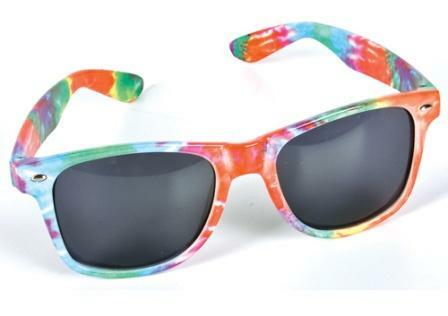 Our tie dye sunglasses are real groovy! They make a great fashion accessory for a 60's or 70's costume, or wear them when you want to be different. Frame coloring is unique to each pair and coloring will vary slightly. These glasses are excellent at reducing glare and provide maximum protection against UVA and UVB Rays. Known by the FDA as UV 400. Meets ANSI z80.3 General Standards.